Let's start simple shall we? What are they? Well you might have seen them around before. They look like big air conditioning units fitted to the back of buildings, but they aren't there to cool things down, heat pumps are there to (as the name suggests) heat things up. They extract heat from their surroundings, which is then pumped into your property throughout the day to keep things toasty warm and to provide hot water. During operation, they deliver lower temperature heat over a long time, as opposed to more traditional heating systems which deliver higher temperature heat over a short time. The idea of lower temperature heat might sound a little bit weird, but don't worry too much about it. All you need to know is that they deliver a steady stream of heating that maintains the temperature in your property, a bit like a reverse refrigerator. GSHPs (again, the cool kids get it) use a loop that runs under the ground surrounding your property to extract heat from under the surface, where temperatures are more stable. 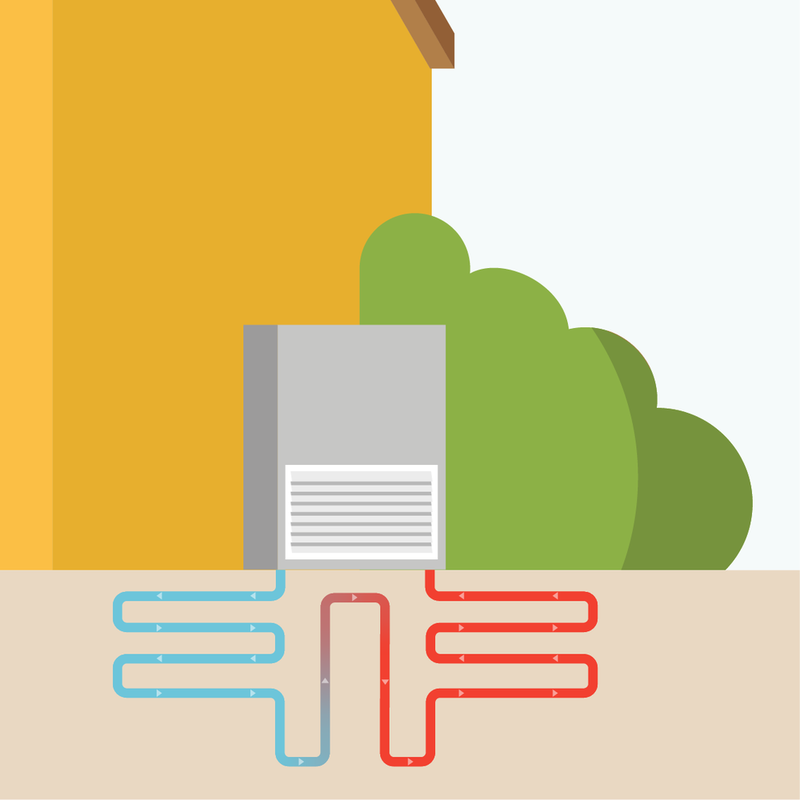 As they draw heat from the ground, they're more efficient and can provide a much greater return on investment. The downside, however, is that they require more space and some excavation to install the ground loop, and they're slightly more expensive. The type of heat pump that you choose depends entirely on the kind of property you have, your available space, your budget and a whole host of other factors. Don't worry too much about the different types, as the points listed below apply to both them, and we'll highlight any specific differences. So now that we're all clued up on what they are, let's crack on with why heat pumps are such a good investment right now! Let's start off with everybody's favourite! Why are they better for the environment than traditional heating? Well, unlike solar panels, where it's very easy to see how they're good for Mother Earth (they make energy out of nothing but sunlight after all! ), heat pumps can be a little bit trickier to understand. The reason they can be confusing is because they do actually require electricity to operate; a heat pump without a power supply isn't going to do anybody much good. What makes them so brilliant, however, is that for every unit of electricity you put into them, they'll give you back multiple units of heat (they're very generous little fellas). Coefficient Of Performance (COP) is a fancy way of saying how much heat they will generate per unit of electricity they're given. For example, a heat pump with a COP of 4 will generate 4 units of heat for every unit of electricity it's given. While the COP can vary between models, most are in the range of 3 to 5 with yearlong weather conditions taken into consideration (this is where ground source pumps benefit, as the temperature underground fluctuates less). Now that you understand COP, it should be easier to see how they're better for the environment: you can achieve the same amount of heating with a fraction of the energy input. To put that in context let's revisit our old friend maths (there was always going to be some). If we want to produce 4 units (kWh) of heat from mains fed natural gas (which has a Carbon Dioxide equivalence of about 0.2kg/kWh), we'll produce 4 x 0.2kg = 0.8kg. So almost a kilogram of Carbon Dioxide released to keep our property toasty. However, with a heat pump, as we only need 1 unit of electricity (0.35kg/kWh) to produce 4 units of heat, we'll produce just 1 x 0.35kg = 0.35kg. So we've cut our emissions by almost 70%, even though each unit of electricity is more polluting to produce. This is almost exactly the same process that cuts your heating bills (which we'll definitely be getting to soon). So running a heat pump off a mains electric supply is a far greener way to heat your home, but you could go one step further! Hook your heat pump to a solar panel installation, and you'll be putting completely carbon-free electricity into a system that makes that energy go even further! For extra bonus points, throw in a battery storage system, and you're well on your way to being a full fledged eco-warrior (with a healthy saving of cash too!). For the calculations in this section we've used the emissions data from the 2017 UK government conversion report. If you'd like to see how other fuels stack up, or want to check for updates, you can find that information at the link below. At Eco nrg, we're big fans of anything that can help our customers reduce their carbon footprint, especially if it saves them plenty of money at the same time! So saving the world is grand and all, but what's in it for me? Well, as with most things, when you cut back on your carbon emissions, you also cut back substantially on your expenses; a wonderful combination that gives you a warm fuzzy feeling on the inside and the spare cash to buy a big jacket that provides a warm fuzzy feeling on the outside. Heat pumps are fed by electricity, and even though (in the UK at least) it's more expensive per kWh than a lot of other fuels, as heat pumps require so much less of it, you end up paying less over all, that's why the COP is so important. Now we can compare how much it would cost annually to heat your property using these different fuel types or a heat pump (remember heat pumps only need 1 unit of electricity to produce 4 units of heat). At just over £300 per year, the heat pump is the winner, closely followed by mains gas. LPG is almost £200 per year more expensive, and electricity is way up there at over £1000 (to be fair, it's unlikely that you would heat a property using only electricity in this way, but this does show how much of an impact the heat pump has). So, in this example the heat pump does provide the lowest bills, but not by much over mains gas. This is where things start to get a lot more personal, and where the makeup of the property and the current fuel source play a huge factor in whether a heat pump is the right investment for you. If you're already receiving low-cost mains gas, a heat pump may not be right for you, as your bills are already low. You would be reducing your carbon footprint, and you would earn from RHI payments (we'll cover that in the next section), but your bills may not change much. Similar to the Feed-In Tariff for solar panels, the Renewable Heat Incentive (RHI) is here to sweeten the deal, and to encourage as many people to make the move to renewable heating solutions as possible. It's a financial incentive, where over 7 years, you'll receive quarterly payments for all of the heat that you generate from renewable sources, which includes heat pumps. We use the term renewable heat because you don't get paid for the unit of electricity that you put into the heat pump, only the extra units that it gives back. That way you're only being paid for the extra, green energy that you're producing. So let's go back to our 8000kWh example property with our 4 COP heat pump. To hit that 8000kWh we're putting 2000kWh into the heat pump in the form of electricity, which it is then returning as 8000kWh of heat. Thus we are producing 6000kWh of renewable heat. The RHI payments you would receive then depend on the technology you're using. Those are some huge sums of money, and the RHI definitely lives up to its name of being an incentive! And once again, things only get better if you've got a bigger, more heat hungry property. Let's go back to our 17,000kWh property where we're already making an annual saving of £350 on our heating bills. If we combine that saving with the RHI payments, it brings the annual payback up to a huge £1,300 with an air source heat pump and an eye-watering £2,500 with a ground source heat pump. With your bill savings and RHI payments combined, you can happily pay off the installation costs, and then just sit back and let the extra cash roll in! For the calculations in this section we've used the RHI rates shown at the Energy Saving Trust. These rates can occasionally change, so if you're reading this from the future, first off, hello from the past! Secondly, best to double check the rates at the link below to make sure you're all up to date! Well, we've covered the main points of why heat pumps are such a great investment, so give yourself a pat on the back for making it this far! Now just a few of the smaller points that help make them an even greater way to heat your property. First off, they're very low maintenance. Once they're installed and set up properly, you can pretty much go ahead and forget about them. They'll just sit there, working away happily and should have no problems. The only thing we'd suggest is a yearly check-up just to make sure that everything is running hunky-dory. That way, if it looks like a problem might be developing, we can catch it early and sort it quickly. But like we said, you should have no problems whatsoever. In case we haven't mentioned it, heat pumps run on electricity. So that means no annoying fuel deliveries first thing in the morning, no gas canisters hidden in the garden, and definitely no mucky fuel to spill anywhere. Once they're installed and all hooked up, all they need is for you to keep the electricity running and they'll perform perfectly. They even run super quietly, so you probably won't even notice it's there (except when you want to brag to your neighbours about your tiny heating bills). Because heat pumps provide a steady stream of low temperature heat, they're perfect for properties that are well insulated, as this allows them to gradually increase the temperature without losing energy through the roof, windows and walls. For the same reason, they're great when combined with underfloor heating or warm air heating, because these systems require lower water temperatures. They still work fine with conventional radiators (although we'll need to double check your equipment), but when paired up with underfloor they create a dynamic duo that keep your property perfectly toasty. The big question! Will a heat pump actually improve your life? Well, there's no one-size-fits-all answer. If you're currently on mains gas, and you're heating bills aren't too bad, unless you want to dramatically reduce your carbon emissions, a heat pump may not be the right choice. That's ok, we're not upset. We want everyone to live as green a life as possible, but only when using the technologies that are right for you. If, however, you're currently using LPG or electricity to heat your home, you've got a little bit of space out the back, and you're sick of rising heating bills, then a heat pump could be the perfect solution for you. You could even go the whole nine yards and sort yourself out with a solar PV installation and an underfloor heating system at the same time, to keep your property at the perfect temperature, all year long, in the most economical and carbon-neutral way possible! You'll definitely struggle to find a better way to make money for nothing! But if you're in any way unsure about whether a heat pump is right for you, don't hesitate to get in touch. We'll help you work out the best solution for your property to make it as green as possible, and to save you as much money as possible. Well there you have it, 6 reasons why heat pumps are an amazing investment. They'll keep your property warm, slash your heating bills, earn you a nice bonus from RHI payments and give you ultimate bragging rights. So why not start your green energy adventure by getting in touch with us and finding out just how much our renewable technologies could save you and the world. We offer completely free, absolutely no-obligation site surveys and quotes, as well as helpful, friendly advice. So what are you waiting for? Let's build your greener future today. We have done our absolute best to make the information in this post as accurate as possible, but as with all things, there is a degree of variation. We've simplified some of the calculations and used generic values in some cases to keep things streamlined. Full heating requirement reports can be a little long-winded, and for the sake of this post we don't want to be blabbing on forever. Under no circumstances should the examples in this post be taken as an absolute indicator of heat pump performance with regard to your own property, and we cannot be held responsible for any decisions made by anybody based on the information in this post alone. We are, however, completely confident in heat pumps as a technology, and we do genuinely believe that in almost every case they are a viable, profitable solution. If you would like a greener future, and think that heat pumps may be the technology for you, please do not hesitate to get in touch. We carry out a thorough site survey for each one of our clients, and we generate a customised heating requirement and payback report for each property that details exactly how much you could stand to benefit from the installation of heat pump. Once again, thank you very much for reading this. We hope you've enjoyed it.